Gotta be honest with you — I don’t know what Apple’s up to with this “MacBook Pro” thing. I’ve been using the iPad Pro and iOS 11 and its successors for years, and now here we have this new thing which we’re meant to give up for the tablet that we’ve been used to for years. Let’s start with the simple things. The weight! This “laptop” weighs a ton. Look: iPad Pro plus keyboard is 477g + 360g or so, call it 850g. This MacBook Pro with the 13-inch screen? It’s 1.37kg! That’s more than half as heavy again, for nothing like that much more screen. Then there’s the price. I can get a 10.5in iPad Pro with 64GB, Wi-Fi only, for $649 — though obviously I want to get the 4G version, which for 256GB is $879; add on the keyboard for $159 and you’re out of the store for $1,038. (OK, add a Pencil for $99.) And you’ve got TouchID, a keyboard, touchscreen, and a display showing 2224x1668 pixels at 264ppi. That’s 3.7m pixels. These new MacBook Pro things though — if you want the integrated “Touch Bar”, which has the TouchID I’ve been so used to for years and actually does have touch function — look, there are the emoji in a swipeable format! — then it’s $1,799! 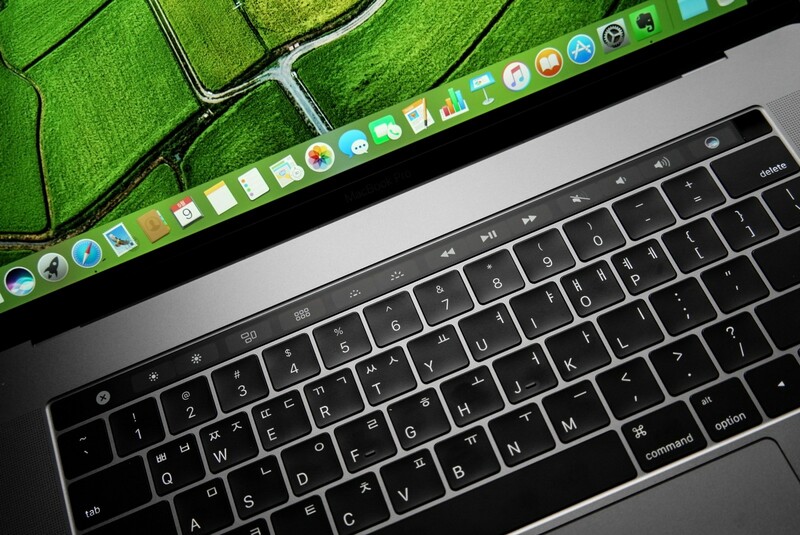 Or you can save $500, get it for $1299 without a Touch Bar. Either way, you’re in for a shock when you turn it on: the screen isn’t touch-sensitive. It might make up for that by having more pixels — 2560x1600 — not bad, 4.1m pixels — but you can’t manipulate them as everyone does, with our fingers. Instead, there’s a giant area on the keyboard called the “touchpad” which lets you move the cursor (or sometimes a little arrow thing) around. No wonder these “laptops” are so big. Those touchpad things don’t do anything else; you can’t type directly on them. And sometimes they get in the way while you’re actually typing. Sometimes I’d just swipe the Touchbar to remind myself what a touch device was like. And felt glad it had TouchID. I mean, some people tell me they just type their password in each time they want to access their machine. This feels like an odd sort of progress. What do people call it, “courage”? These laptops do have lots of “ports”. You can plug another screen in — though it’s still not a touch screen, so ¯\_(ツ)_/¯ — but honestly, it’s as though they’ve forgotten that these machines already come equipped with Wi-Fi and Bluetooth, which everyone uses. There’s even a headphone jack, for crying out loud. OK, I had one on the iPad Pro, but you’d not see me using it. I had to give up my implanted SuperPods for in-ear AirPods a while back, but even so — wires?? For headphones? Apparently you can use these ports to plug in separate hard drives, and even something called a “DVD player” which seems to be some sort of archival format for films. Why do I want this when all my stuff’s in the cloud and my connection’s fine anywhere? is a question I still haven’t managed to answer. Storage is OK — 128GB to 512GB, though they seem proud of themselves for having solid-state storage. Folks, isn’t all storage solid-state? Next you’ll tell me you’ve got a great idea where you store data on spinning disks coated in magnetic paste! Hahaha, I think I saw that on The Onion. Though I’ve got this friend who assures me it’s just round the corner. Listen, there is one thing I do quite like about this laptop thing: you can sit it on your lap pretty much anywhere, and angle the screen to your taste. Saves you perching the iPad keyboard on a briefcase or similar. Oddly enough I almost always ended up having it at the same angle as the iPad Pro keyboard offers. Still, the big thick base is darn solid, and it did keep my lap toasty warm from time to time. As for screen size, which people said would be the Big Difference (that, and the screen angling) — OK, it is nice to have a bit extra. But sometimes it feels a bit overwhelming, especially with all the windows, as I’ll explain. Software-wise, the change is not that much of a shock at first. There’s the Dock that I’m used to from iOS 11; you can even (I found a Setting) put it on different sides of the screen. Unlike iOS 11, it’s always there, unless you find the other Setting which makes it automatically disappear like it should. I had some trouble at first when I kept pulling apps out of the Dock to make them multitask and they just vanished. Finally I realised that it’s like iOS 11 where you just press on the app to launch it. Then the app does this weird thing where the Dock icon bounces and bounces and OH MY GOD JUST RUN ALREADY. Laptops are sloooow. And every so often the machine would just stop and the cursor would turn into a sort of whirling rainbow. Is it some sort of Apple deal with Gay Pride? I never got that on the iPad. Once you do have your programs running, there’s no window organisation. Seriously, the screen is a mess. The windows all overlap. You drag them around with the pointer thing. All the nice organisation of iOS 11 — one, two or three apps on screen; clear demarcations — is gone. After an hour or two my screen looked like a teenager’s bedroom. (Oddly enough, my once-tidy bedroom seems to be going the same way.) There are keys which make all the windows run away like cockroaches from the light, but of course you can’t then pick the one you want out with your finger like you want to; you have to use the pointer thing. My arm got so tired from pressing the screen expecting stuff to happen. Still, all the programs I’m used to are there (with a couple exceptions, which we’ll come to). There’s Microsoft Office suite, all the Apple apps like Pages and Keynote and Numbers and Notes and so on — thankfully, my content has all synced. Scrivener for writing anything from a short piece to a book. Coda for file transfer and updating sites, basically all your FTP and PHP needs. The graphics apps are all a bit stymied by the fact you have to use this mouse thing, or else an intermediate “graphics tablet”. Drawing this way is really strange — there’s a disintermediation effect, like when you cross your index and middle fingers and rub your nose and it feels as though you’ve got two noses. I can’t just draw on the screen with a Pencil? Seems not. I did discover one action where the laptop seemed better: selecting and editing cells in spreadsheets. You have to learn to do this one weird trick called a “double click” to make it happen, but once you get used to it you can breeze through stuff. Also, programs on the laptop are expensive. Like, wow. Adobe has a program called Photoshop which is basically all the iPad apps it sells rolled into one and then doubled in price. And it has a zillion “pallettes” all over the screen. You’d think the windowing system was broken. Except we know it is. You know I said missing software? Let’s talk about workflows. Or Workflow! The app which lets me write little programs to automate all sorts of things on my iPad — when I want to grab a selection of text from a Safari page and send it to a Note, or look up a map reference by highlighting some text and getting Maps to search for it — is not there. It’s gone. There’s something called “Automator”, but it’s incredibly limited, with baasically zero third-party integration (the thing that makes Workflow so awesome). I dug around a bit and found another scripting program that comes built in, called Script Editor, which runs something called “Applescript”, which seems a decent enough scripting language, and has third-party integration sometimes. But heaven knows it’s no Python (or Pythonista). It feels a lot harder to do things like writing files and accessing dialogs. Quite the learning curve we’ve got there. And that’s before you get to even simpler workflows. Can I aim the (rear-facing) camera at a document and import it to write on it, like in iOS 11? No. Can I do a bit of augmented reality for relaxation, such as going to Buckingham Palace in Maps, choosing Flyover and then moving the iPad around as though I had a private helicopter? No. What happened to my tape measure app, my Minecraft-in-the-kitchen app? Nah, laptops can’t do that. Can I even take a screenshot and edit and annotate it and send it to someone, which is one of the most basic workflows on iOS 11? Not without huge effort — first you have to discover the three-finger (three!) secret combo to take a screenshot, and then you have to figure out where the screenshots have gone. The “Screenshots” album in Photos is all stuff from my iPad. Which brings us to files. Not Files, like on the iPad, where you can whisk through your files (I tend towards the minimalist on this, to be honest), but on the laptop all the files are crapping all over the place. It’s the most amazing mess. No, I’m not going to tidy my bedroom. I mean, I’m sort of struggling with this stuff. But I guess this is what the future looks like. Though my friend tells me that graphical stuff and personal computers are on the way out — he says that the way forward is something he calls the “command line”, where you control the machine just by typing letters, and you don’t even have your own machine; everyone shares what he calls a “mainframe”. Sounds kinda crazy. But I guess we all have to adjust to the way the world is changing all around us. This is what progress looks like, people. Enjoy this? Each weekday I produce a set of links, mostly about technology and science, plus a little politics/economics, at The Overspill. You can read the web page or sign up for the email.